I wish I could say that I have been quilting up a storm. 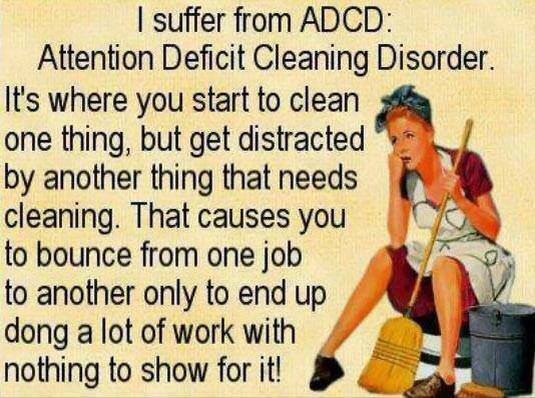 Just busy doing stuff that needs to be done, like cleaning house and entertaining company! I guess my daughter would say that she and her husband aren’t company, they are family. When someone comes to visit and stay with us, I make extra effort to please them, so it is like having company. Although I have done some sewing, too. Finishing projects has been what I have really been up to lately, although that wasn’t truly the goal. Feels good though, to get things DONE! Finished the tablerunner and placemat tops. Quilted and bound one, but haven’t finished the binding. I will show you a picture of it anyways–binding clips and all. Not really Christmas colors, but with the glitzy gold quilting thread, I think they will be perfect and they are stars! 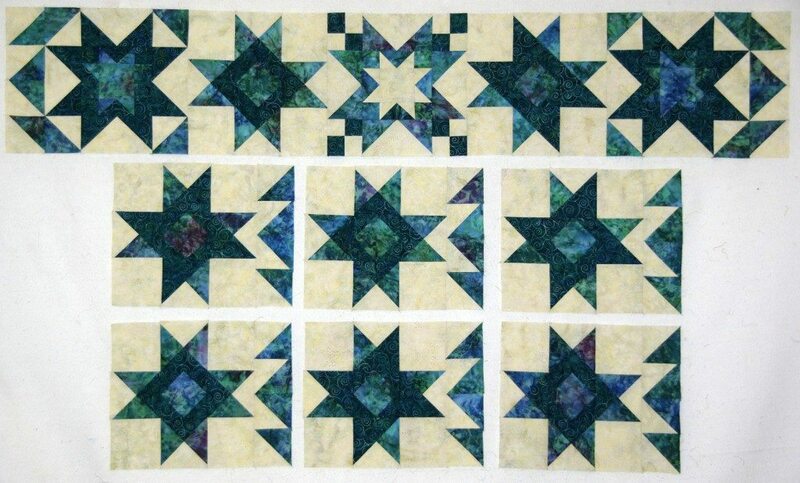 I am going to be adding these to the Sewfasst Class that I will be teaching at Academy of Quilting. My grand-daughter is going to be Saint Agnes at her school for All Saint’s Day, so I made her costume. Not too complicated, could only go by her measurements, as she lives halfway across the country. Hope it works out. Halloween, as we know it was originally called All Hallows Eve, the night before All Saint’s Day, a Christian holiday. The word Halloween or Hallowe’en dates to about 1745, and is of Christian origin.It comes from a Scottish term for All Hallows’ Eve (the evening before All Hallows’ Day). In Scots, the word eve is even, and this is contracted to e’en or een. Over time, (All) Hallow(s) E(v)en evolved into Halloween. Although the phrase All Hallows’ is found in Old English (ealra hālgena mæssedæg, mass-day of all saints), All Hallows’ Eve is itself not seen until 1556. Our priest bought a quilt at a silent auction, but it had no pocket for hanging. So I applied a pocket and fixed the binding. 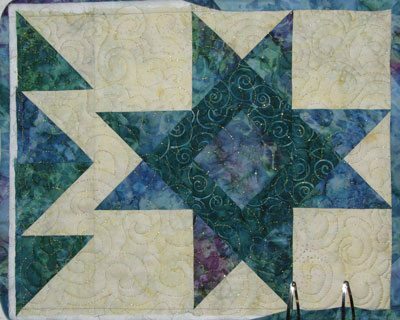 A non-quilting person would have thought it was just fine, but it needed some help. Miter binding corners, please, don’t just wrap the binding around the edges! There are lessons on the web. Mmmm, maybe I should do a blog on that, it really isn’t hard. 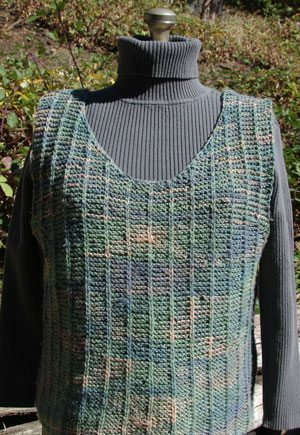 And finally I FINISHED knitting two vests. I guess what tickles me the most about these is that I started them in 2007. That is started, but because of various factors, I would get close to finishing and then put them away. Finally finished them and didn’t like the way they looked on me, so ripped them out and started over. 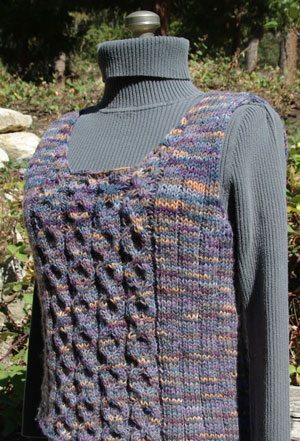 I finally figured out my own pattern and am having so much fun, that I am on the third one. They are all different. Once I figured out the basics, how many stitches I needed to sew them in the round, that was all I needed! Changing to different kinds of stitches and including cables has been fun. I really like knitting in the round, because I hate seaming knitted things. Wish I could eliminate the shoulder seams too! At least they are short. 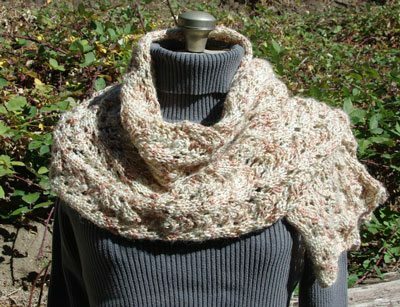 And finally finished a scarf that I started a while ago too. All these great warm projects, we better have a cold winter!